My daughter Jenna texted me this message a few weeks ago while she watched the halftime events of an National Football League game. “Hey, Punt Pass and Kick is on the halftime show!” I didn’t bother to run and watch. I have seen kids kick a football. I was once one of those kids. 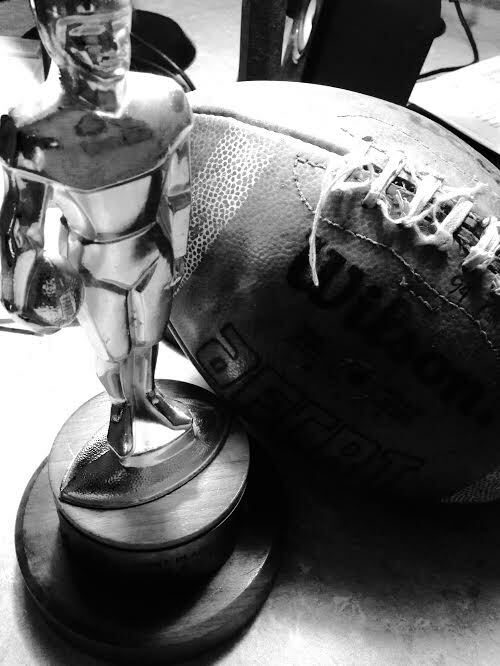 I have many gold PPK trophies from my youth and if not for a stubbed toe on my punt, would have won the Oklahoma State PPK and been invited to compete at halftime of a Dallas Cowboys game as a nine-year old boy. I care little about that now…it was the center of my universe, however, as a nine-year old. My picture in the paper, trophies, peer respect, congratulations from the adults at church and school. For a kid struggling to develop an identity and a little self-confidence, it was all I had. On the one hand, I was an insignificant kid…on the other, a local hero. And I’ve carried this sense of insignificance and high achievement all my life. I’m not good enough, yet look what I’ve done. It’s what motivates me and what frightens me. It’s the yin and yang connecting my deficiencies with arrogance. The balancing force, the counterweight, the thing that keeps me from flying into the weightless space of narcissism. Harold Ramis, died February 24, 2014. He was an American actor, director, and writer specializing in comedy. He played Egon Spengler in Ghostbusters and Russell Ziskey in Stripes, along with writing and directing Caddyshack, National Lampoon’s Vacation, and Groundhog Day. This morning, listening to NPR while driving to a job site, someone quoted Mr. Ramis speaking about the interdependence of his self-doubt and his self-confidence. It struck a chord, so when I got back to my office, I found it on Scott Simon’s column, Simon Says featured on NPR. One of the reasons Harold lived in Chicago, he said, was to see himself as the kid who made deliveries for his father’s North Side liquor store, even as he’d become — as he would never put it — one of the most influential writers and directors in the history of comedy. Harold Ramis came back onstage for a Second City reunion in December of 2010. It was just before he was struck with the autoimmune disease that would claim his life this week, at the age of 69. “A great rabbi story: You should start each day with a note in each pocket. And one note says, ‘The world was created just for me today,’ and the other note says, ‘I’m a speck of dust in a meaningless universe.’ And keep them both … because neither is true and both are true. “So in a way my career has been completely self-aggrandizing. I’m the most pumped up, grandiose person in the world, and I’m still the same humble schmuck I was when I started. I have no confidence, and yet there is this body of work that exists behind me that seems to say that I did do something. Indeed, we frame our work with episodes of self-doubt and great achievement, but they don’t work in isolation, but rather, in partnership. We are all artists of contradiction, specks in the universe yet endowed with incredible creative power and imagination. We are artists drawing pictures creating shades and shadow using obstacles that block the light. We are cooks in the kitchen blending fire and water marking the fine line between incredible taste and inedible ash. Tight rope walkers balancing in the heights, wary of the depths below. Mortal humans hiking on a journey this side of death, made more alive when we feel the other note, in the other pocket, the one that says we are no better than cheese in a freezer case with an expiration date, yet somehow, marvelous, glorious and wondrously made. Thanks to Egon Spengler and a Chicago rabbi for reminding me of those two notes in my pocket. I always knew that there was something wonderful and exciting about you. You have just reminded me that you must have had a wonderful upbringing. I only wish that I had it all together as you appear to have. What a wonderful note.